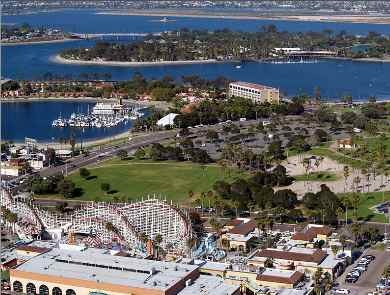 Belmont Park San Diego is located in Mission Beach San Diego, at the west end of West Mission Bay Drive. This fun amusement park offers an old-fashioned roller coaster called The Giant Dipper, and many rides for the kids. Belmont Park San Diego is an old-fashioned beach front amusement park, located right next to Mission Beach. It has something for everyone – roller coaster, kids rides, laser tag, rock climbing wall, zip line, swimming pool (currently closed for remodeling) and So Cal fun wave machines. You can watch for free or buy tickets and join in the fun. Belmont Park offers a great value, compared to buying tickets to a larger theme park. Buy the kids unlimited ride wristbands, or the combo pass, and parents can watch for free. You can make your stay just a few hours, or plan to spend the whole day and enjoy the beach, shops, and Mission Bay Park. Our teenagers love to ride the rollercoaster and other rides at Belmont Park Amusement Park, or spend time on the Mission Beach boardwalk. This is such a fantastic area because there is so much to do at San Diego Belmont Park! And Mission Bay Park is right across the street. Photo aerial view of Belmont Park San Diego (see Roller Coaster on bottom left) with Mission Bay Park and Mission Bay in background. Operating Hours: Daily from 11 AM, closing times vary. Parking: Limited free parking is available, or there are some paid parking lots down the street. Nearby Attractions: The FlowRider and FlowBarrel simulated surf machines are there for bodyboarding and surfing. Great fun to ride or just watch. You can also swim in The Plunge indoor swimming pool - just awesome (check below - closed for remodeling). 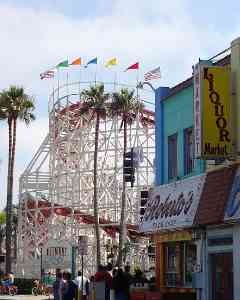 Belmont Park San Diego is also conveniently located right along Mission Beach and an easy walk from Mission Bay Park . You can ride bikes or skateboard along the boardwalk down to Pacific Beach, or shop at some nearby stores. SeaWorld is one mile away. Belmont Park Ticket Prices: Free admission, which is nice if parents or grandparents just want to watch. The current prices are $30.00 for 48" and taller, and $20.00 for those under 48". Sometimes they offer a slight discount if you purchase in advance online. They also offer a combo pass which includes the rock wall, laser tag, and 2 turns on the zip line. The price is $54.00, but don't pay full price - check out discount opportunities first. Belmont Park Discount Tickets and Coupons: The unlimited ride wristband is a good deal, even better if you buy a San Diego Go Card or Go Select option. Check your Entertainment Book as it may offer buy one get one unlimited ride band free. For more information about Belmont Park discounts, coupons and 2 for 1 offers, see San Diego Coupons. You can also request online coupons from their website, which will be emailed to you. Online Belmont Park Mission Beach coupons. Recently I received ones such as save $5 per person on unlimited ride wristbands and save $3 on a round of miniature golf. Just a few yards away from all the Belmont Park rides and The Plunge is the Mission Beach CA boardwalk, a great place to bicycle or rollerblade in San Diego. The nice sandy Mission Beach is right on the other side of the cement boardwalk. Note that The Plunge pool is undergoing remodeling in 2015 - 2017, which is delayed. Per their website, it will open in 2019. We look forward to seeing it open again, as it is a beautiful pool in a historic building at a beautiful location right near Mission Beach. From Interstate 5 in San Diego, take the Grand Avenue exit and go west. Turn left on Mission Blvd. Park in the free public parking lots at the north and south side of Belmont Park Mission Beach in San Diego, or at the end of West Mission Bay Drive in SD. Click on the link above to open the Google Map for Belmont Park San Diego and other attractions in San Diego and southern California.